D'Aleo on NOAA and NASA | Watts Up With That? The pressure has been mounting. The public doubt about global warming has been increasing in the past year given Climategate, and how promises of warm snowless winters failed. After cold and snowy winters in 2007/08 and 2008/09, the winter of 2009/10 was the coldest ever in parts of the southeast, and in parts of Siberia and the coldest since 1977/78 or 1962/63 in many parts of the United States, Europe and Asia. This past December was the second coldest in the entire Central England Temperature record extending back to 1659. It was the coldest ever December in diverse locations like Ireland, Sweden, and Florida. Reluctantly, alarmists changed their tune and the promise of warm and snowless winters as recent as 4 years ago morphed into global warming means cold and snowy winters. NASA/NOAA homogenization process has been shown to significantly alter the trends in many stations where the siting and rural nature suggest the data is reliable. In fact, adjustments account for virtually all the trend in the data. Unadjusted data for the best sites/rural shows cyclical multi-decadal variations but no net long term trend as former NASA scientist Dr. Ed Long showed here (PDF). He showed however that after adjustment, the rural data trend was made consistent with the urban data set with an artificial warming introduced. For the Full Report in PDF Form, please click here. Can you provide some names and references, please? it looks like the entire global warming/cooling for the past 30 years is centered around the earth’s magnetic poles. how can this be explained by co2? Once again Joe D’Aleo is right on top of the mischief from NASA and NOAA — which sounds a lot like the mischief at the Met Office as well. What happens when a cyclical temperature trend turns out to be Cyclical and not supportive of your government grant rationale? You “normalize” the data so the trend no longer appears to be cyclical, but manmade. Sooner or later the Congress (or a new administration) is going to understand that the biggest violation of the Data Quality Act is in the temperature data and will (hopefully) force a reissuance of official data that will show cyclicality and not any AGW. At that point, the entire facade of AGW will come apart and everyone will declare the Emporer has no clothes. Which will probably mean a lot of “climate scientists” will either be re-writing their grant applications or looking for new work. At least one can dream, right? Given all of the aggressiveness of “adjustments” which have always been made and the obvious existence of the UHI, why do so many skeptics believe that the planet is actually warming? This madness won’t stop until these unscientific adjustments are fully exposed through congressional hearings. Calling the 112th congress…….let’s get it rolling!!! After 26″ of new snow at Breckenridge in the last 24 hours, their total for the year is already 262″, a mere 38″ from their marketing average of 300″ per year, and it’s still January with two weeks till February (normally the 2nd snowiest month of the year, followed by March, the snowiest.) Suzy Chaffee and her global warming commercials about less snow seem rather silly now. SPPI is a fake “science” organization. Their Virginia address is only a P.O. box in a shopping center store. This same organization also is connected to a fake “Evangelical” organizaton whose head sometimes claims to be a minister and sometimes a physicist. And now Kent Clizbe, who claims to be an ex-CIA operative, is stalking Dr. Michael Mann and offering a milti-million-dollar bounty to rat him out. Kent Clizbe does not speak for the CIA. This is getting annoying because many climate scientists have security clearances and cooperate with the CIA on global warming. They have access to national reconnissance systems. Just think what it could be like if we had sprayed SO2 ( or was it H2SO2?) into the atmosphere to prevent the nonexistent warming as was recently suggested by one US government wonk. GCM’s have always shown the poles to warm more rapidly than the equator when factoring in the rises in GHG’s. This is the famous (or infamous) “polar amplfication” caused in part by the melting of sea ice which opens up more open water which absorbs more sunlight, causing more warming etc. The N. Pole in particular has been shown to warm faster in the GCM’s than the S. Pole for several reasons. The first being the fact that the S. Pole is a huge continenent covered by a huge slab of ice and thus it will take a lot more warming to melt that ice, but the second reason is the fact that the Southern Ocean acts as a much larger open heat sink taking in the warmth more readily than the relatively closed and smaller Arctic Ocean. The fact that so many AGW skeptics don’t understand the basics of polar amplication or talk endlessly about why the S. Pole is not responding the same way the N. Pole is tells me they haven’t really taken the time to look at the science (or perhaps really don’t care?) as to why all the GCM’s show the poles to warm faster than the lower latitudes (with the N. Pole faster than the S. Pole for reasons given above). Does no politician (or researcher ) read this blog – the best and most informative science blog bar none. If they did the last six posts – including Peterson – would convince them that cAgw is at best a severe exaggeration and at worst a fraud. Yet another nail in the coffin of the stupidest hypothesis in science history. Where are the MSM investigative journalists – it really feels like a conspiracy of silence. If you look at the diagram however, it is not the geographic poles that are changing. It is the magnetic poles. This cannot be explained by CO2 as CO2 is not magnetically charged. This poster has sent prior info from this site to Congressman Ralph Hall, R Texas. Ralph is committee chair now of the House Science and technology Committee. I will send and many of you who post here should also send a fax or e-mail to he and other members of the committee, to include the Democrats as they seem more into crossing the isles just now. Ralph flew off carriers in the Pacific in WWII , he is not afraid, in fact some say he runs 4 miles a day ever day he has a chance still. I know him myself. He has the eyes that say no fear. They need to ditch as many urban stations as possible, and rely heavily on rural sites as there is no accurate means to assess for UHI therefore ALL data from theses sites are inevitably corrupt. Of course this wouldn’t suit their agenda so it won’t happen, but in an ideal world where climate scientist are only interested in the truth, it should. “Marketing average”? What a cool term, could be obfuscated and added to the three m’s – mean, median, mode, and markit. Does anyone know if they do tax returns? No comment re: the data for rural vs non-rural temperatures? Guess those cities don’t produce any heat. Only right we should “adjust” those rural temps to show warming in the name of real science. GCM’s have always shown the poles to warm more rapidly than the equator when factoring in the rises in GHG’s. This is the famous (or infamous) “polar amplfication” caused in part by the melting of sea ice which opens up more open water which absorbs more sunlight, causing more warming etc. Yes, and if anyone had thought about it for a moment, is fallacy. Right now, the Arctic is moving toward it’s high point of ice/snow coverage. But is still below the baseline. POP QUIZ!!! How much less albedo effect is occurring now as opposed to 30 years ago in the arctic? Well, none. You have to have light to reflect light. The arctic could be ice free right now and it wouldn’t make a tinker darns worth of difference. The light (heat) shines on the arctic when its at its ebb in terms of ice content. The polar amplification was improperly amplified. Hansen has stated that terrorism and violence are justified in the pursuit of his public policy preferences. So surely he must also be capable of rationalizing a belief that tampering with data is acceptable so long as it is in the service of (what he perceives to be) the noble cause. But R Gates you cant have it both ways open water in the south keeps things from warming up but in the north open water warms things up. Which is it? Besides when the major melt that occurred in 2007 NASA made the a point of telling repeatedly that most of what happened up there was because of the wind direction being somewhat unusual. Yes. I think if you actually calculate the AMS data (I do not recall where, but I found it all once) the number is significantly lower. Ski resorts tend to pick areas on the mountain – above the base – that point in the direction of the most favorable snowfall totals. While riding up the front lifts at Copper Mountain, for example, even during very snowy periods, you can’t help but notice the opposite facing slope (across I-70) that has nothing on it, both from increased sushine and simply less snowfall. There’s also the issue of snow to water ratio, which tends to be very high in Colorado, so adding 10″ from March to 10″ from January doesn’t make much sense realistically, but that is beyond the scope of the terminology I used. It is worth noting that this 26″ was a very low ratio snowfall (and hard to ski, I’m pooped today.) Keystone, which you can see from Breckenridge, only got 4″ in the last 24 hours, interestingly enough. Can you please not post my earlier comment but post this comment instead (my observation was posted in the middle of a quoted passage – not after the quoted passage. “…Yes, and if anyone had thought about it for a moment, is fallacy. Right now, the Arctic is moving toward it’s high point of ice/snow coverage. But is still below the baseline. POP QUIZ!!! How much less albedo effect is occurring now as opposed to 30 years ago in the arctic? As far as albedo is concerned, it is the areal extent of ice in May, June and July that is most important. What evidence does he have that the cause of any Arctic warming now is any different to the 1920’s + 1930’s when by all accounts similar conditions existed? Well according to my rather clear memory, this is not the case at all! The original GMC’s clearly showed equatorial warming coming first in the mid troposphere with the heat feeding north through circulation by the Hadley Cells. It was going to be a roasted Sahel with millions of deaths and climate refugees! Shimmering dry heat in the tropics! Remember? The big switch to ‘polar amplification’ happened when a) it was shown conclusively by none other than Monckton that the troposheric hot spot was non-existent and b) when the ice started retreating in the North (only). Of course the polar claim was already there in print so as to be able to refer to if it Plan Alpha didn’t work (which it didn’t). In the 80’s, when the Antarctic 20 year ice cycle (look it up) was in the retreating phase we were all warned daily about collapsing ice shelves – unprecedented! In the 90’s of course the ice returned in the South. Silence on the warm front. Now that the cycle is repeating we will no doubt start hearing recycled stories about how NOW it is Antarctic ice that is ALSO collapsing (again) as the North quietly recovers. An interesting twist to the non-existent hot spot is that the whole point of modelling it was to show that CO2 captured heat ‘like a greenhouse’ above the Earth. The fact is there may indeed be a warm spot but the temperature fiddlers have so successfully grafted warming onto the surface temperatures that there is no different between the surface (as reported) and the mid-troposhpere (as measured). Maybe it is actually there! It certainly is not settled science! Look on the bright side: when the surface temps are shown to be nonsense, being actually lower than they have been reported to be, you can always revive the old and (currently-discredited) story about a hot spot in the tropical troposhpere! You can show Monckton was a liar by proving Hansen is a Liar! Trumpet the former! You can recycle the old arguments about Hadley Cells and GCM’s showing anything you want (because they are written to do exactly that). You might even be able to get out a few radical warmist phophecies before the whole thing freezes over and a cold famine grips us all. I at least will be able to burn stacks of your outlandish claims and bad science to keep warm. Oh yeah, not warmer air, melting ice exposing the darker water. Too bad the ice has been advancing. See the ice page thoughtfully supplied free by WUWT. And those warmer Southern Ocean temperatures? Check with ARGO. How’s this: maybe you can claim that the oceans are cooling because of the advancing ice, giving credence to the ‘ice cover’ theory (operating in reverse). Some evidence is there, IMV. The only problem is you would have to admit to the truth of the ARGO temperatures and the increase ice extent (not volume) data which puts your whole 40%-increase-in-CO2-will-cause-calamities theory back to square one. Still the confusion between weather and climate on both sides of the divide. The term “virtual” would be used by truth tellers, “fake” by AGW fanatics. Just because all the prominent personnel aren’t sitting in the same office building does not make them “fake”. Assuming this were true, which i don’t know, this would invalidate Joe D’Aleo’s statements exactly how? And what science is fake or not fake is in the eye of the beholder. Letting imperfect GCM’s run to 2100 is not even any kind of science IMHO. It’s tinkering; it can be fun, but it’s not science. Unfortunately the article reads like something from The Watchtower. I don’t think propaganda of this sort is helping anything. Some of the evidence alluded to is from the same publication, for instance. I am interested in the facts, not bias either way. He does a lot of post at real climate were he preaches to the choir and opposeing are not allowed. So it is good to see his ilk posting here, maybe he will learn something. You can’t say ‘garbage in’. Not when they actually get healthy raw data in. Their models are more similar to the digestive system: food in, crap out. While the weather was warm…. As soon as the weather gets cold…. Whatever will they say if next winter is lovely and warm? Meanwhile, back in the real world and specifically that of the UK, a 3.7% rate of inflation finally has awoken the MSM. Of course, the fast rising price of oil has been their main gripe, with the vehicle fuel escalator (a greenie- weenie invention whereby the tax rises each year by !% plus inflation in order to cut down our usage and save the planet) becoming the focus of their attention, together with the costs of electricity, oil and gas for heating, all of which carry an as yet unremarked escalator known as the renewables obligation, to pay for that other brilliant green genius invention , the wind turbine. Also known as Modern Art – Still Life. Definitely not a Turner. Now the bills for November and December are coming through the doors, and people are seriously squealing. These green taxes, added surreptitiously to all power bills, have now reached a critical mass, and represent a not inconsiderable portion of the bill. The MSM must decide whether to report the existence and malign effect of these hidden Renewables taxes, thereby attacking the government’s green agenda, or face a further slump in circulation as people call into question their raison d’etre. The summer months is when albedo has its greatest effects, but I wouldn’t call it important. As I pointed out earlier, every year the arctic’s albedo contribution is zero’ed. As in nothing. It doesn’t gain or lose as momentum or inertia it is reset to zero every year. The polar amplification is a misnomer. It should be called polar curtailment. To say that they’ve underestimated polar albedo would be to imply they didn’t consider it at all. In a post on your blog that you reference in comments above, you write that a certain commentator is an “ignorant, arrogant demagogue”, then go on to write that you don’t watch the station on which that commentator resides. I don’t want to tie up Anthony’s blog with politics so I’ll end here. Dr Viner of CRU made that assertion back in 2000 I believe. Google his name. Nice bit of mis-direction. This thread concerns GHCN data, and its manipulation by NOAA and NASA, and not esoteric unverifiable GCM theory. But if you insist, the IPCC said a decade ago that the main footprint of GHG induced AGW will be the tropical mid-tropespheric hotspot. Once this pocket of warm air is forced poleward by the Hadley Cell, the mid-latitudes and high latitudes would warm. My how narratives change so quickly. In 2002, no one was interested in the poles. Now that the tropics have failed to warm, the Alarmists talks about little else. Noelle says @ January 18, 2011 at 9:38 am: Can you provide some names and references, please? Robert F. Kennedy Jr. (2008) Snow and sledding are things of the past. Global warming means no snow in D.C.
Dr. Michael Oppenheimer (2000): points out that global warming is the most significant reason that sleds now are unused. Robert McClure (2006): Global warming means less snow in winter. Claudia Tebaldi, scientist National Center for Atmospheric Research (2006): Our study shows that we suffer more extended droughts. Both NOOA and NASA should renounce their dependency on “BIG GOVERNMENT” dollars which are corrupting their science. Anybody this far in the pocket of politicians should take this step to cleanse themselves of the corruption that goes hand-in-hand with “BIG GOVERNMENT” dollars. No, doesn’t that sound a bit funny. How does it feel to have the shoe on the other foot ? So it’s not explained by CO2, according to your answer. BTW: Can you explain where the data for the North Pole comes from? Would you please consider adding a brief/simple explanation of both the NASA/NOAA homogenization process, and what the NASA/NOAA justification is for same? That would really make this article both far more meaningful to many many readers, and more complete also. I’m suggesting just a brief paragraph or two…. or links to good brief articles on those issues. The NASA/NOAA data adjustment and homogenization is mentioned all over the place, but its far rarer to see any explanation of the basics involved, and, of course, most importantly how NASA/NOAA justifies those adjustments — in terms understandable to those who even if scientists perhaps, aren’t in these fields or familiar with these specific issues, let alone the well educated laymen out there (including those who read here religiously!). Scientists are followers of a cult, defending dogmas with which they do not wish to part. Scientists have proclaimed these dogmas to be established laws, when in reality they are nothing but views, and erroneous ones at that. The melting ice in the Arctic has prompted a movement of frozen CO2 (dry ice) as a replacement. However all failed when the dry ice sublimated, drastically increasing the CO2 concentrations in the polar region. Higher CO2 levels, as everyone knows, led to higher temps. Or maybe the temperatures were just adjusted higher by GISS? Google search for the term “Watts up” used to return the home page of your blog at the top of the list. Now it is buried three pages down. For some reason , the lnk didn’t work . But you can find it . Well a recent World Cup Ski event scheduled recently in Slovenia, had to be cancelled because of a lack of snow. And the events cancelled were ones where Lindsey Vonn normally cleans up; so she lost out on some points opportunities. Meanwhile there was plenty of snow in Switzerland around Wengen, where they got off some Slalom, downhill, and Super-G races. German Skier Maria Reisch has been killing them; with her skiing. So maybe Slovenia is not the place to go skiing. AGW is the only ‘science’ that can never and should never be falsifiable. It is morphing into a religion and has nothing to do with science. Hard to reconcile this with Snapple’s self proclaimed above average smartness. Why it is even posted on his blog. With really truly smart guys like Snapple supporting catastrophic anthropogenic global warming what chance do skeptics have. Pity though he couldn’t work out to click the contact link before engaging in anthropogenic global tom foolery. I gues you would have to be way way above average bear smartness to have thought of that. “Risk of summer drought is likely to increase in central Europe and in the Mediterranean area. The duration of the snow season is very likely to shorten, and snow depth is likely to decrease in most of Europe”…..
Not to pile on to R Gates, but it bears mentioning that the MWP has been dismissed by alarmists based on the assertion that it was a regional phenomenon. There is paleoclimatological data to dispute that claim, but assuming it’s true, how do we now have catastrophic global warming when it’s evidenced primarily by polar amplification? It was autumn, and the Red Indians on the remote reservation asked their new Chief if the winter was going to be cold or mild. Since he was a Red Indian Chief in a modern society, he had never been taught the old secrets, and when he looked at the sky, he couldn’t tell what the weather was going to be. Nevertheless, to be on the safe side, he replied to his tribe that the winter was indeed going to be cold and that the members of the village should collect wood to be prepared. But also being a practical leader, after several days he got an idea. “It looks like this winter is going to be quite cold indeed,” the meteorologist at the weather service responded. So the Chief went back to his people and told them to collect even more wood in order to be prepared. A week later, he called the National Weather Service again. The Chief again went back to his people and ordered them to collect every scrap of wood they could find. Two weeks later, he called the National Weather Service again. “How can you be so sure?” the Chief asked. I just tried the terms “watts up” in google and this blog came top of the list. The most sensitive place on the planet to CO2 increases should be antarctica during winter. The reasons are twofold. 1/ The main CO2 absorption band corresponds to a temp of -60degC. The proportion of energy absorbed by CO2 in this band decreases as temp warms. 2/The other two bands overlap with water vapour and so only have an effect when water vapour is extremely low such as over antarctica during winter. During summer the CO2 absorbs less than half the energy as during winter due to the higher concentration of water vapour absorbing most of the energy in the CO2 spectrum. Since the antarctic has been cooling for the last 30 years their is clearly a problem with the models! In addition methane will have virtually no effect on climate as its absorption band corresponds to a water vapour band as well. The strength of the various greenhouse gasses is a joke as it was measured in a dry atmosphere and they never include water in their measurements! The narcissistic crank Snapple sometimes deigns to make appearances elsewhere on the internet. From this I can report the following fun fact: She is a teacher in the Washington D.C. metropolitan area. Yes, there are schoolchildren being exposed to her on a daily basis. How ya doing Snapple? Still got Russia on the brain? Now that’s funny. Not that she is teaching, but that one can run, but one can’t hide, from the internet. There are skeptic teachers out there–my youngest told me at dinner that his math teacher “doesn’t believe in global warming.” No word on the science teacher, however. GCM’s have always shown the poles to warm more rapidly than the equator when factoring in the rises in GHG’s. This is the famous (or infamous) “polar amplfication” caused in part by the melting of sea ice which opens up more open water which absorbs more sunlight, causing more warming etc. The N. Pole in particular has been shown to warm faster in the GCM’s than the S. Pole for several reasons. He also predicted 225 mph hurricanes amongst other nonsense. In another 5-10 years once the AMO flips, climate scientists programmers will suddenly realize there isn’t much north of 90 deg. so will need to reconfigure their GCM’s and we’ll be told it’s worse than we thought; GHG are causing Arctic freezing. There is nothing unusual or particularly alarming about Arctic “polar amplification”. Ok, I get that part, they have been leaving the UHI put for cities but just adding warmth to the rural stations so all rural station’s temperature now look like they are cities. How dishonest! But I couldn’t find a singular date of occurrence. The amount seems ~0.16ºC and a guess at the date seems ~1999. Has anyone been able to find closer numbers? We are being tricked by Nature. The AO did the same and 10 east of Nova Scotia and 60 east of Southern Argentina. These warm ocean spots are keeping the Arctic and the Antarctic waters warmer than normal. 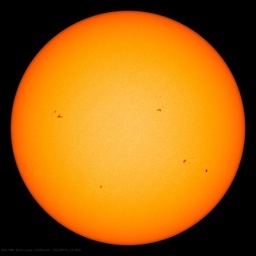 The Quiet Sun, for the last 5 years, has not replenished the oceans heat. When these warm ocean spots lose their stored heat, there will be no warm ocean to replace the heat. So both the “Warmers” and Nature has conspired against the “Deniers”. I’m buying heating oil ….. for July. Well that helps ‘splain it. WDC Metro probably scores the lowest in the entire world on any kind of academic test. Unfortunately, there is no way to fire her or to correct that situation (witness the recent ousting of Michelle Rhee). Based on Snapple’s post above, she’s more than a narcissist, she’s completely paranoid and probably delusional. But, just a reminder to Snapple: just because you’re paranoid, it doesn’t mean people aren’t out to get you. What do you think those CIA operatives are really doing? “Watts up” in my google search had this blog at the top. In fact, the whole page consisted of Watts up With That entries. 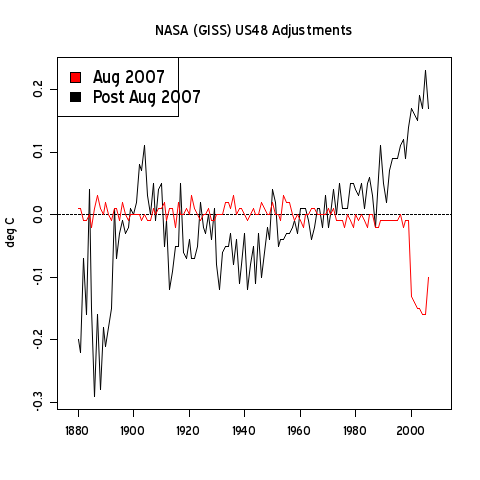 The very climate/weather is the undoing of GISS/NOAA. They have been so busy playing with adjustments that they forgot to keep an eye on what was going on outside. Now, they are as lost as the GCM’s they lean on for support. Like Little Bo Peep, they have been losing their sheep… faster than previously imagined. Glad to see WUWT back on page one. That stupid emeter had pushed WUWT down the list. Regarding Google searches – the Google results depend entirely on what kind of history Google has compiled on you. Flush all your cookies and try again. It would be astonishing if the results don’t change dramatically. Google is adaptive which means it applies a bias to results of a quere based on prior knowledge of the system providing the query. They are in the business of selling ad space, not unbiased search results. Read Chill by Peter Taylor and much that is going on is explained. Climatologists are hypnotised by trends and ignore cycles. If you enter a cycle at a low point you get a warming trend which is assumed to continue. We all know that it does not and will overturn to become a low again. We are at the top of a cycle at the moment and the cooling will continue. The Argo data sets show cooling oceans and when they cool so does everything else since the oceans carry heat round the planet, not CO2! I think some (not all) who appear to believe it actually only accept it for the sake of argument. The reason would be that there are skeptical arguments that work even if the planet is warming. In any difficult field, not only science, a great deal of argument uses premises accepted for the sake of argument. I’ve noticed that many people find this hard to understand. If you argue that way, they think you believe something which actually you either do not believe, or only believe might be true. whoops – I forgot to check “Notify me of follow-up…” so I’m checking it with this message. Hmm, whoever this Snapple is, she’s certainly got my attention now. A teacher in the DC area, eh? Interesting……shouldn’t be too hard to ……. I certainly understand accepting a premise simply for the sake of argument, and I certainly understand that the existence of GW doesn’t give any credence to AGW – and surely doesn’t give any credence to CAGW. However, I’m asking about skeptics that truly believe that the planet is warming – that truly believe in GW. Have they reached this conclusion after looking at unadjusted temperature data which was properly collected and/or adjusted for UHI effect? I don’t know how to trigger a notification so I figured I would simply blockquote this comment. Alternatively dont use Google, use Scroogle, it give the same results as google, but without the cookies! Mr. Gates, no matter how much you repeat incorrect statements, that repetition does not make them true. Obviously, you are a learned individual capable of understanding complex issues, but you undermine your credibility by making statements like this. Okay, perhaps your statement could be persuasive for someone who has minimal knowledge of the issues, but there are many people on this blog with more than minimal knowledge. GCMs definitely have not “always shown the poles to warm more rapidly.” I remember when we were excited to get the Sahara Desert to show up in Africa on these GCMs. Of course, GCMs have come a long way. When we first started having the poles warm faster than the rest of the globe, it was an equal opportunity development — for both north and south poles. In fact, there was some thought that warming would take place faster at the South Pole. First, the air is dry there, so the impact of CO2 could be more quickly observed. Although well-mix GHGs would get to both polar regions, Antarctica is more isolated climate-wise than the Arctic. The Arctic has more interaction with other oceans, more subject to pollution . . . , so Antarctica would be the spot to watch. However, since 2005, the Arctic has emerged as the canary in the coal mine. Now, whether models currently are capturing the true state of affairs, or whether (as all models do) they behave better as more recent data are used for inputs — that is a subject I will not address in this post. So you could say that “recent developments in GCMs point out that the poles warm more quickly.” Then you would start with a platform of credibility. Just for completeness sake, just to say that January 2011 so far in UK has been slightly milder than normal, although there is still time for a slightly colder snap to bring it closer to normal. It certainly won’t be breaking any cold records, though! My belief that the planet is warming is little influenced by temperature data – unadjusted or adjusted. The majority of glaciers in the globe have shrunk in the last 240 years. Also, I was influenced by the spread of crops and plants north in the continent and by longer growing season. However, I have been surprised by the ambiguity of the last two points. Crops can handle more northern latitudes not just because of global warming, but also via hybrids & genetic engineering and via increased CO2 (plant food) in the air. Also, the movement toward later fall frosts and earlier end to spring frosts has not been as monolithic as I had anticipated before research. The beauty of AGW is that after the real data has been properly “adjusted” and “interpreted” by the “climate experts” we will still have “the warmest ever” as our present anomaly. And it not, then it was just “weather” which should never be confused with “real climate change”. This is a serious allegation. One that if proven to have a factual basis could irreparably destroy any remaining credibility for the idea of man-made global warming. I see that Snapple is taking a well-earned pasting here. On 11th Richard Littlemore ran an article attacking Kent Clizbe (Note 1) then on 21st he was onto the back of Tim Ball. Along with that we had his fellow disciple of the CACC doctrne Snapple renewing his attacks on John O’Sullivan, just as he was on that other disciple, Joe Romm’s Climate Progress (Note 2) on 16th. Romm was a bit nasty, suggesting that “ .. Clizbe is either an ex-CIA contractor – a mercenary who finds that anti-Islamic “counter-terrorism” is no longer paying the bills, forcing him to take money from people who want to make trouble for legitimate climate scientists. Or he’s a kook”. (Maybe he’s simply a “spook”). “Snapple”, also make nasty comments involving associates of mine with his “ .. A propagandist named John O’Sullivan .. a fossil-fuel mouthpiece called The Canada Free Press. .. One of the editors of the CFP is the infamous Canadian denialist Tim Ball. .. ”. Well, at least John and Tim and Kent do have the courage of their convictions by publishing their names, background and contact details. I visited “Snapple”’s blog (Note 3) and took a look at his “complete profile” and what are we told there? Only that his blog is “Legend of Pine Ridge”, just where we started. What convictions does “Snapple” have?. It would seem that he is not proud of those he hold about climate change, otherwise he’d be happy to let all of us know who he is (as I have said on another of your threads, I have low regard for those who hide behind false names). On that page “Snapple” has an article “Kooky Kent Clizbe Does Not Speak for the CIA” which makes mention of “ .. Kooky Kent’s promoter, blogger John O’Sullivan . ” and “ .. the malignant denialist Tim Ball .. ”. Well, I can see why he’s scared to let people know who he is, but he shouldn’t think that he can hide on the Internet. I’m sure Kent could easily use his CIA contacts to track him down, then watch the libel action. After all, John is not only “ .. the world’s most popular Internet writer on the greenhouse gas theory .. ” but is also a “Science writer and legal analyst specializing in anti-corruption .. ” who has been “ .. successfully litigating for over a decade in the New York State courts and U.S. federal 2nd circuit. .. ” (Note 4). Watch out Snapple, he may come to get you. Convictions proudly held are to be respected, which does not mean accepted so let’s get back to someone with the courage of his convictions, John O’Sullivan. I don’t see eye-to-eye with John on everything but I do have respect for his courage. His opinions on climate change are not only in the Canada Free Press but, like mine, are plastered all over the Blogosphere. Having managed to “ .. debunk of the greenhouse gas theory .. ” (Note 6), the next major objective appears to be the formation of Principia Scientific International an International. PSI is planned to be a not-for-profit association of scientists and other interested parties aiming to spread scientific truth globally, starting with climate science. Anyone interested in helping it to be set up can make a charitable donation to this fledgling global scientific association at the Go Fund Me site (Note 7). You can find out all that you need to know at the PSI Web-site (Note 8) which advises that “Our PROPOSED Board of Directors is: Dr. Martin Hertzberg; Dr. Claes Johnson; Joseph A. Olson; Alan Siddons; Dr. Charles Anderson; Rev. Philip Foster; John O’Sullivan; Hans Schreuder ”. On the GlobalWarmingSuperheroes “O’Sullivan’s Selective Myopia” thread (Note 9) one Jeff Daley claimed that “I was told John Osullivan is going to announce in Janaury the setting up a new science association called Principia Scientific International to sue all your criminal warmist buddies for fraud”. That is nonsense dreamed up by someone with a very vivid imagination. As I said on that thread “Taking a look at PSI’s Articles of Association (Note 4) I could find no mention of any intention “ .. to sue all your criminal warmist buddies for fraud”, so please Jeff, let us all know who told you that fairy tale – or were you just telling porkies? .. ” (NOTE 10). BTW, I submitted this comment to Realclimate today and – surprise surprise – it hasn’t yet appeared. I wonder if it will get past the “hockey team” without being “snipped”. College-bound students study global warming. This information is well-established and is presented in the science books. All the scientific organizations such as the National Academies say global warming is happening. The posters on the walls in science classes are from NASA, not the SPPI mailbox in the parcel post store. The Pentagon and the CIA also are studying how to respond to global warming. Many of my students are from highly-educated families in government service, and they expect their children to learn what the scientific research says. Certainly Catholic schools teach global warming because the Vatian says there is global warming. For Catholics and many Christians, global warming is a social justice issue and students are even encouraged to be advocates on behalf of the climate change issue. I doubt that the CIA is chasing me since I am saying exactly what the CIA says on my blog. According to media reports, head of the CIA’s Center on Climate Change and National Security is named Kobayashi. As in, “My name is Kobayashi, I work for Keyser Soze. It’s more likely that the CIA is tracking foreign-sponsored disninformation about climate change, just like they tracked the people who spread the KGB propaganda about the Pentagon making AIDS. The CIA gives security clearances to the best climate scientists so they can study the information gathered from the satellites, so the CIA isn’t hunting teachers who say there is global warming. To learn what the CIA says in the public domain about climate change, visit my site. When I e-mail Cuccinelli’s deputy, W. Russell, I use my real name. Mr. O’Sullivan also knows my real name. If he wants to reveal it, he can. I am also not especially worried about lawsuits . I have a very high-powered, huge, international law firm that would defend me for free. The apocryphal “ex-CIA case officer” Kent Clizbe does not scare me. If Clizbe is a former CIA officer, he is very dishonest not to criticize the CIA instead of bragging about his former association with them to get credibility because the CIA says there is global warming. The CIA aren’t hounding the climate scientists; they are giving the climate scientists security clearances. Plus, the CIA is not hounding teachers. They are trying to protect the country from the national security threats that are going to be created by global warming. Maybe the CIA is even getting pretty sick of people who hound climate scientists. The criminal who gave Attorney General Cuccinelli 55,000 dollars didn’t use his real name. Why aren’t you mentioning that? The fake Navy Veteran “Bobby Thompson” even made up about 100 fake names for his charity’s officers. Don’t you wonder why Cuccinelli didn’t wonder about that? “Bobby Thompson” gave money to politicans who were in a position to change our laws so that military charities would not have to register and disclose information about themselves. In Virginia, the law was changed, and now any drug dealer can claim to be a military charity. “Bobby Thompson’s” lawyer is now cooperating with the authorities. She claims that this criminal who did not use his real name may have run to E.Europe or the Middle East. She claimed he bragged about his friends in foreign countries. I notice that the Canada Free Press has retracted their allegations about the Canadian climate expert Dr. Weaver. I also notice that the Canada Free Press seems to have removed the retraction as well as the article by blogger John O’Sullivan which describes how Kent Clizbe–supposedly a former CIA case officer–is spaming professors at Dr. Michael Mann’s Pennsylvania college and offiering them millions to denounce Dr. Mann. The Canada Free Press claims to be very pro-American, but they are denigrating US, British, and Canadian scientists as well as mischaracterizing the position of the CIA on global warming. If the Canada Free Press, John O’Sullivan, Kent Clizbe, and Pete Ridley wish to report on what the CIA thinks about climate change, they should contact the CIA, not Kent Clizbe. Perhaps they would like to disagree with what the CIA is finding with its satellites and other national technical means, because Kent Clizbe is not a reliable source on the CIA position. Northwestern University’s prestigious Medill School of Journalism’s National Security Reporting Project is also running a series of articles based on interviews with CIA, Pentagon, and National Academy of Sciences officials. Hi “Snapple”, it’s all very well using you real name in E-mails to Russell and O’Sullivan but do those people know that you also hide behind the false name Snapple when it suits you? I doubt it, because I’ve just E-mailed John O’Sullivan for your real name and he doesn’t know any Snapple. Let’s at least have a first name so that we can exchange opinions on a friendly first-name basis, otherwise I might start calling you Steve and no-one else will know who I’m addressing. When you comment about me I’m perfectly happy for you to refer to me by my full name or even just Pete rather than calling me a “blogger-moron”. By the way, you once again formed a totally incorrect opinion with your “ .. A blogger-moron who is angry that I defend climate scientists criticizes me for using a nom de plume on my little blog .. ” (Note 1). I’m not angry with you, just sorry that you appear to have swallowed hook, line and sinker the propaganda dispensed by the UN’s IPCC. I didn’t criticise you for using a nom-de-plume, I criticised your hiding behind a false name, giving the strong impression that you are a coward who does not have the courage of your convictions, unlike Kent Clizbe, John O’Sullivan and his crusading team of dragon-Slayers. You harp on about global warming being taught to your students but do you also teach them about the enormous uncertainties that exist among scientists about the causes of all that global warming and cooling that goes on. Ecologist Professor Barry Brook of Adelaide University put that point beautifully back in April 2009 when he said “ .. There are a lot of uncertainties in science, and it is indeed likely that the current consensus on some points of climate science is wrong, or at least sufficiently uncertain that we don’t know anything much useful about processes or drivers .. ” (Note 2 – but please read the whole paragraph because Barry gets very upset when I only quote what I see as being the most significant piece – and note that implication of his that we know 95%, a figure pulled out of the air without justification). Professor Plimer has been awarded two Eureka prizes, for science promotion and best science book, and a Centenary Medal for his geological contribution to Australian society UNQUOTE (Note 3). What impact did that book have on global climate-change policy-making? I suggest NONE. Nearly two years later we have another book “Slaying the Sky Dragon .. ” with its publicists making no less extravagant claims (see the links in my previous comment). It will be interesting to see what criticism this one and its authors attract from the disciples and followers of the CACC doctrine. 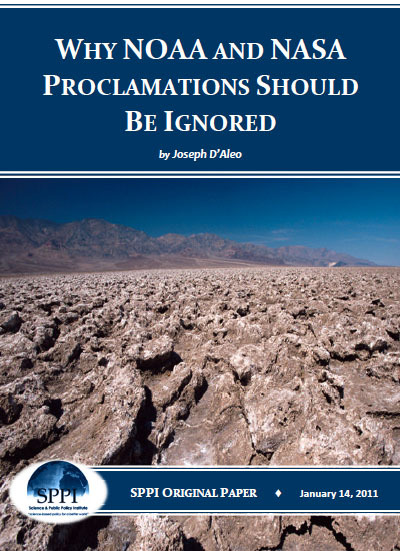 Not satisfied with one book which it is unconvincingly claimed “ .. expertly debunks the established theory of man-made global warming- the so-called ‘greenhouse gas effect.’ Prepare to be astounded .. ” (Note 4), the Slayers have plans to take their crusade world-wide. Of course that could depend upon raising enough money from charitable donors (Note 5). If the first 9 days are anything to go by it could take a while for them to achieve their objective, but maybe there are things going on behind the scenes that will move the launch along. Then again, maybe potential donors are waiting for something more convincing than QUOTE: .. the world’s first full volume refutation of the greenhouse gas theory that was “the talk of the Cancun Climate Conference” (Viscount Christopher Monckton) UNQUOTE even if it might be a “best-seller” (Note 6). Perhaps we will see followers of the CACC doctrine taking a closer look at the claims made for and in that book and at the level of relevant expertise of its authors. VJ briefly hinted at this with his mention of claims about Tim Ball’s previous position at the University of Winnipeg. The Canada Free Press 2007 article “Global Warming: The Cold, Hard Facts?” (claimed to be by Tim) says “ .. I have a Ph.D, (Doctor of Science) from the University of London, England and was a climatology professor at the University of Winnipeg .. ” (Note 7). There have been suggestions that Tim was Professor of Geology and had lied about his position but I think that this has been an unfounded accusation. My understanding is that Tim was Professor of Geology and also taught climatology in the Geology Department but has been deliberately misquoted out of context. Desmogblog ran a short article on Tim which included comments like QUOTE: .. Ball and the organizations he is affiliated with have repeatedly made the claim that he is the “first Canadian PhD in climatology.” Ball once claimed he was “one of the first climatology PhD’s in the world.” Many have pointed out that there have been numerous PhD’s in the field prior to Ball. His degree was in historical geography and not climatology .. UNQUOTE (Note 8). Maybe Tim will make the time to clarify this point. In late December I was invited into the expanding group of sceptics that has been debating the future for “the Slayers” and its fledgling scientific organisation Principia Scientific International (PSI). Shortly afterwards I did some “due diligence” research into PSI so if anyone is interested we could have a discussion around that. You may recall that in my last comment I mentioned trying unsuccessfully to get a similar comment to the first one that I submitted here posted on the “hockey team’s” RealClimate blog. Another believer in the doctrine that our continuing use of fossil fuels is leading to catastrophic changes in those different global climates (Note 9) is dear old IT-man Ben Lawson of Wotsupwiththat (Note 10). Ben makes a feeble attempt to challenge the real thing (Note 11) but, despite his “ .. interest in endurance sports sports such as triathlons and marathons .. ” (Note 12) runs shy (like Snapple) of revealing his true identity. Ben seems equally shy of facing the wrath of “the Slayers”. He has kept my comment about them “awaiting moderation” since 23rd. What’s wrong with you DAGWers? BTW, Snapple, “ .. It might be good to look at some of the business interests that own/control publishers/magazines .. ” including the owners of Stairway Press and E-book Partnership. You might find that “ .. They probably become gatekeepers .. ”, because, as you say “..the major media is often owned by fossil-fuel interests .. ” (Note 13). Then again, maybe you are just a conspiracy theorist in disguise. On another matter altogether (nowt to do with those poorly understood causes of climate change) did those donations a year ago to the Haiti fund make any significant difference to their miserable existence? (Note 14). According to the latest reports they are still barely existing while we grow fat and enjoy all of the benefits of a modern lifestyle. The word “hypocrite” springs to mind, or do you chose to deny yourself of those benefits? If so then I sincerely apologise. I will be posting these subsequently. Wm (January 18, 2011 at 4:00 pm) can you feed a bit more about Snapple’s pedigree. I’ve just had a response from John O’Sullivan who doesn’t know any Snapples, Sniffles or Snuffles but suggested that it might be a male pest not a female one. JimF (January 18, 2011 at 5:57 pm) don’t be so hard on poor old Snapple. Just because you reject his/her opinions there’s no need to say that he/she is paranoid. It brought tears to my eyes when John suggested the same of me recently. Snapple, regarding those enormous uncertainties underpinning the IPCC’s position on CACC, maybe, as a teacher of vulnerable youngsters, you should help them to learn how to discriminate between fact and fiction. Northwestern University’s Medill School of Journalism has a National Security Reporting Project and is publishing an informative series of print, video, and interactive stories about climate change at a site called Global Warning. The Global Warning series is based on what the CIA, Pentagon, National Academy of Sciences, and all our other scientific agencies are learning about climate change and about the threats these changes pose to America’s national security. My favorite story is called “Our Man in the Greenhouse: Why the CIA is Spying on a Changing Climate.” A very similar story was published by McClatchy (1-10-11), and they have a video interview that works.